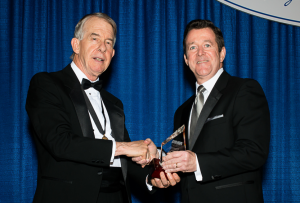 2015-16 KMA President Ted Miller, M.D., PhD, presented Shawn Jones, M.D., of Paducah with the Distinguished Service Award during the Leadership Dinner at the KMA Annual Meeting. Jones was also recognized as a KMA Community Connector. Photo by David Knapp for KMA. 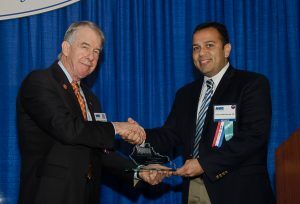 2015-16 KMA President Ted Miller, M.D., PhD, presented Sen. Ralph Alvarado, M.D., of Winchester with the KMA Community Service Award during the Kentucky Physicians Leadership Academy at the KMA Annual Meeting. Photo by Mary Branham for KMA. 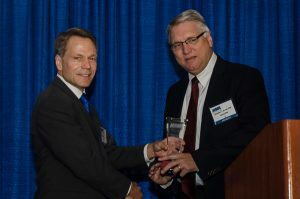 James Borders, MD, KMA CME Council Chair, presented Sheldon Bond, M.D., FACS, of Louisville with the KMA Educational Achievement Award during the Kentucky Physicians Leadership Academy at the KMA Annual Meeting. Photo by Mary Branham for KMA. 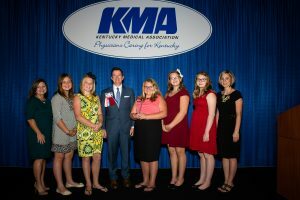 Shawn Jones, M.D., fourth from left, a Paducah otolaryngologist who was presented with the KMA Distinguished Service Award, complimented the Middlesboro students who worked to get a smoking ban passed and were recognized with the KMA Debra K. Best Outstanding Layperson Award. Pictured with Dr. Jones are teachers Tonya Martin, left, and Kelsey Massengill, right, and students Haylee Mills, Chloe Burchett, Ryann Tong, Sabrina Sparks and Kaylea Martin. Photo by David Knapp for KMA.